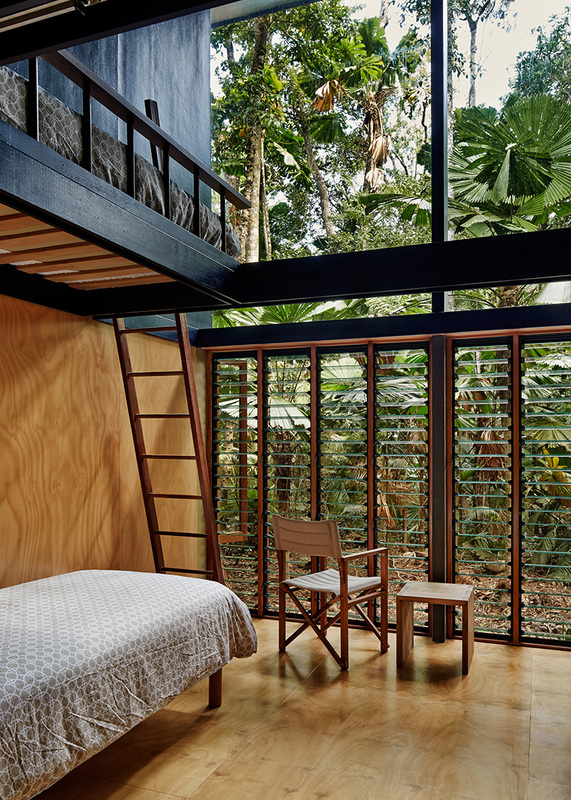 Want to see a home in the middle of the rain forest? We have featured homes located in the city many times already. You have seen how most of these homes tower from the ground to create a cozy home while taking advantage of the views around it. But aside from homes in the city, there are also homes that are located in forests and other interesting locations. I can recall that we featured one house that is around rocky mountains and those on deserts. But they all look lovely and are considered an ideal home for the owners. Today, we are going to show you a house that is located in the middle of the forest. 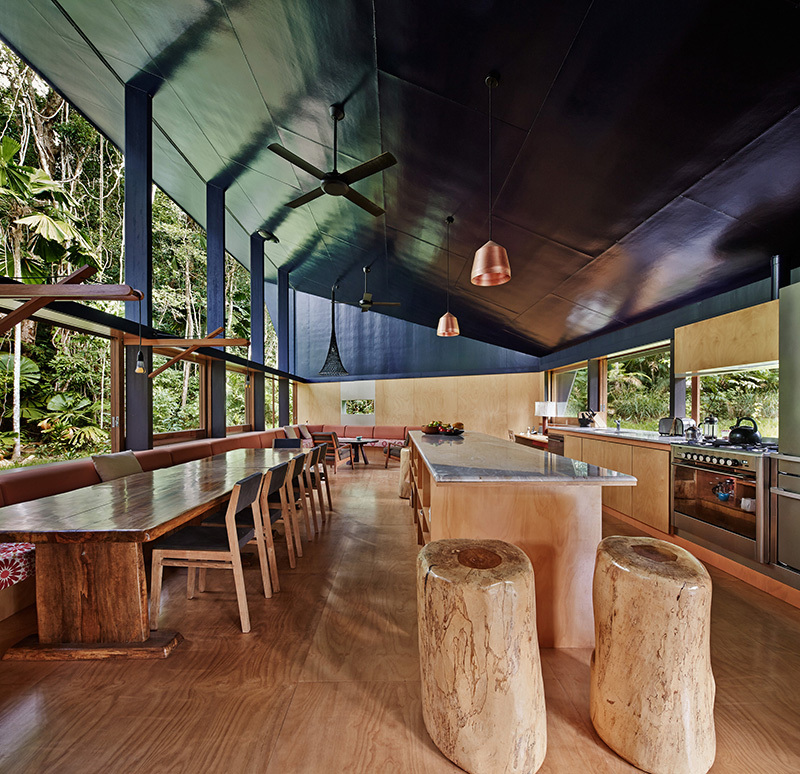 The Cape Tribulation home is located within the Daintree Rainforest, in Queensland, Australia. The unique contemporary home is designed by M3 Architecture. The design was built around the idea that it has a sensitive natural surrounding eco-system. This home is built without cutting any trees because the lot it is standing on is naturally occurring clearing. Isn’t it relieving to know that no mature trees were removed from the site during construction? 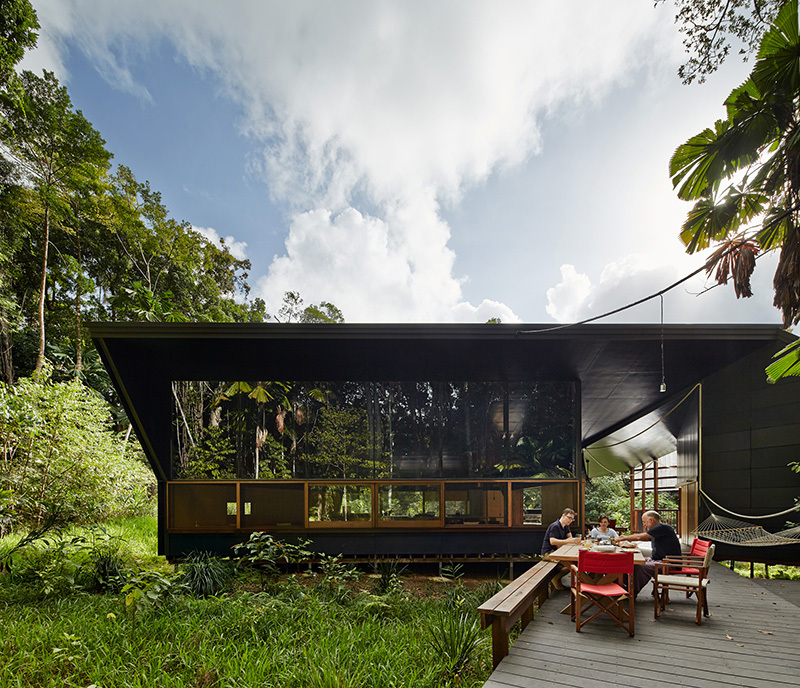 According to the designers, “the exterior of the home is camouflaged with black plastic cladding and mirrored glass, allowing it to recede into the shadow of the rainforest canopy.” Nice idea right? 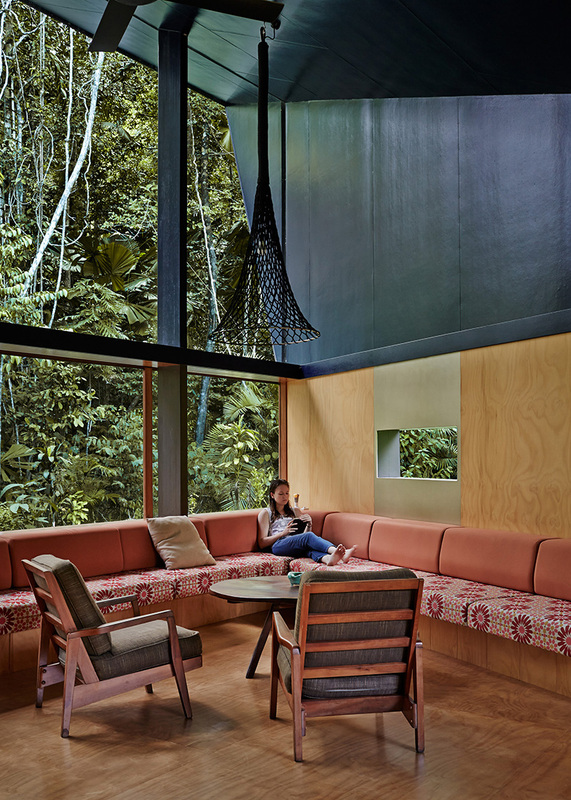 Meanwhile, in the interior, it looks light with the “space clad with plywood, that opens out to the rainforest surrounds, and engages the canopy through tall south-facing windows.” Let us take a look at some images of the house below. 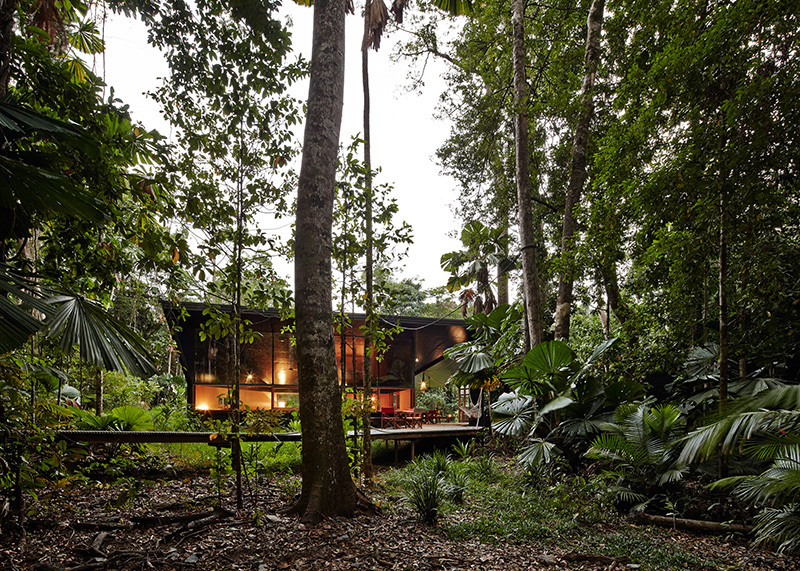 Unique feature: A home located in the middle of the rainforest which has a contemporary unique design. For sure, once you see this home, you will be impressed of how it is designed and how the views and nature is being maximized here. 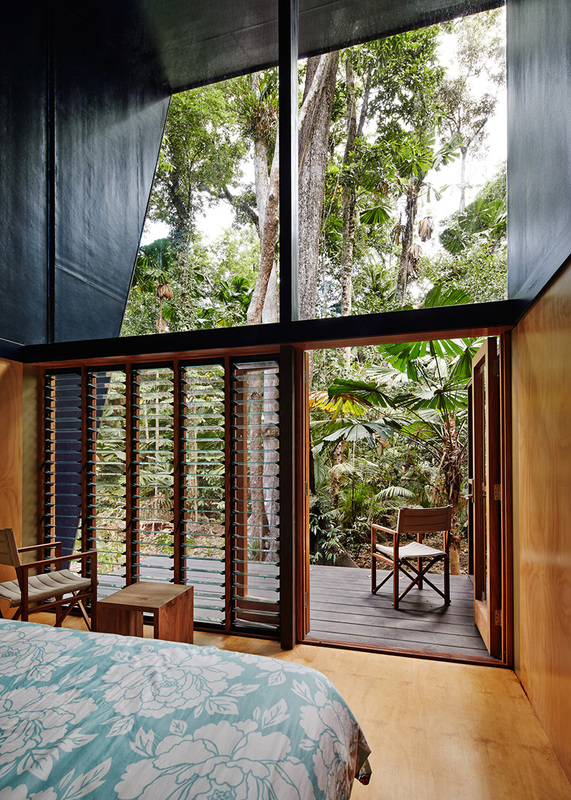 The Cape Tribulation house is a unique home located in the rainforest. It has a well-designed exterior and a very relaxing interior that make use of wood. The exterior of the house also has mirrored glass in it. Notice that you can see the trees reflected on the mirrors. Just imagine spending time in this home! It would be awesome! This is how the outdoor space of the house looks like. You will seemingly have an adventure while in here, right? If you are walking in the forest and you do not have the idea that there is a house like this in there, you will surely be amazed once you see it. There is an outdoor living area that is under a black plastic cladding that looks really nice and attractive. It is also nice that red and white chairs are used for the area so that there will be pops of colors in it. I can imagine how nice it is to spend some time here. Seen here is the interior of the house with a long dining room table. You can see that the bench in the dining area is extended to the in the living room. You can also see here the kitchen space with chrome pendant lights. Since the house has windows around it, it is naturally ventilated, assisted by ceiling fans. Also, all the appliances and fixtures in the house are energy efficient. 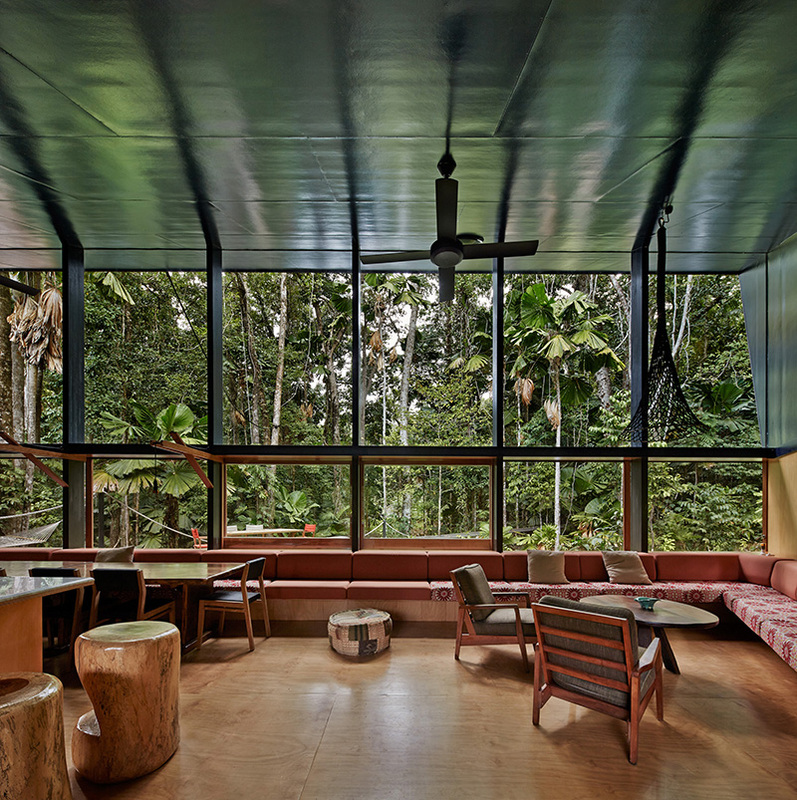 Looking at this space reminds me of the reality TV show, “I’m a Celebrity” and “Survivor” because of its colors, materials, design and its nearness to nature. In the living space, there is a built-in seating that makes full use of the interior space. It is a good idea to add patterns on the seats paired with plain colored backseats. Aside from that, my attention is also drawn to the lighting too. According to the designers, ” white rope that winds through the property is used here in order to show people the way to the various sections of the property. It sounds interesting to me. I wonder how they do that! 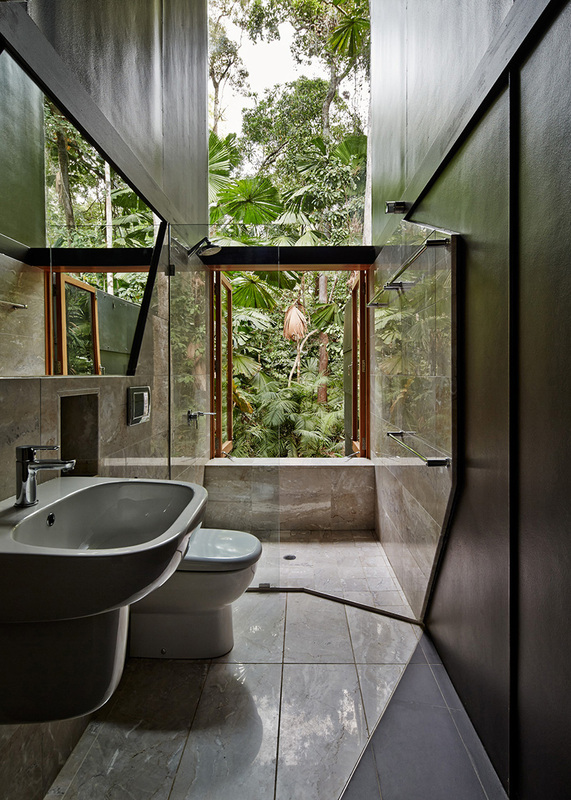 The bathroom has a full view of the rainforest which will make you feel like you are actually taking a bath in the middle of the forest. Aside from the view, the bathroom has a nice modern design too with modern fixtures and equipment. It has a shower area and a toilet. The house has various bedrooms that can accommodate multiple sleeping arrangements as you can see in this picture. Aside from the bed on the floor there is also an elevated loft bed where one can also rest and get a good view of the surroundings outside. The bedroom has jalousie windows that can be closed for privacy. A terrace can be accessed right from the bedroom through wooden doors. Notice that the bedroom is open and airy and is of course very bright because of the glass windows used in it. So, what can you say? 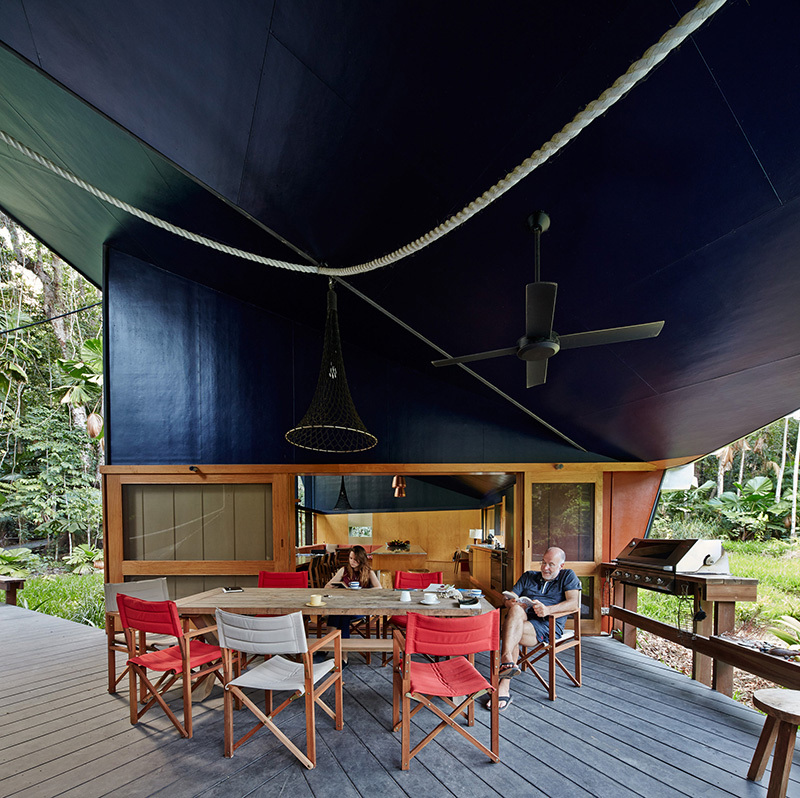 Well, it is actually possible to live in the middle of the rainforest. But it isn’t just about living here but it is also about being able to live comfortably in a contemporary home that has an impressive design. The house makes use of wood for its design as well as glass windows too. Even the choice of furniture is impressive and perfectly fits into the motif of the area. 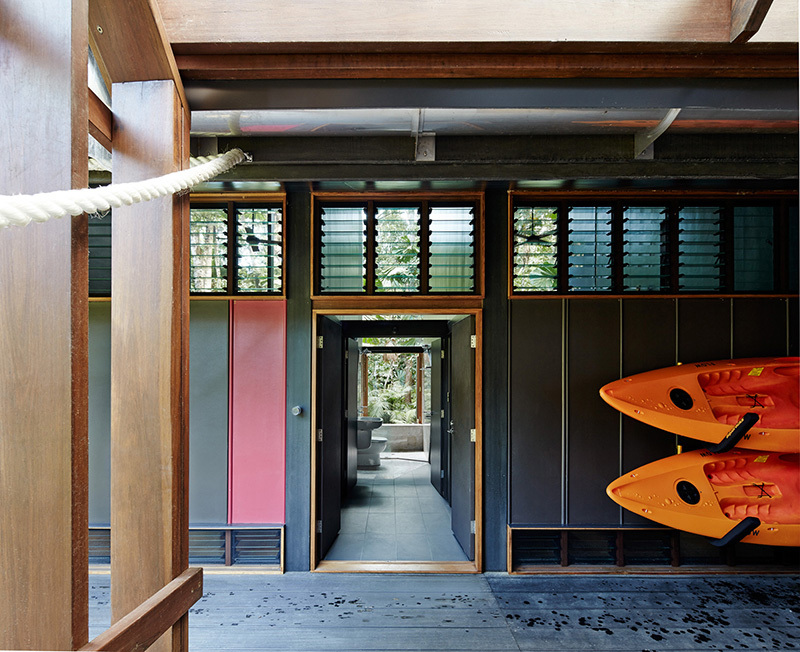 The Cape Tribulation Home is design by M3 Architecture. Obviously, with the look of the house, they were able to design the space successfully, right? And it turned out very inviting and relaxing at the same time.